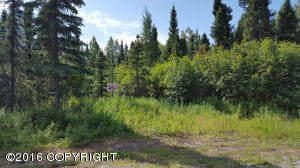 DESCRIPTION: Perfect property for a residential home w/southern exposure. There is a semi view and electric is adjacent to site. Paved road to property. DRIVING DIRECTIONS: Sterling Highway south to aprox. MP 113. Property is on the corner of Blue Ribbon Avenue and the Sterling Highway. Look for real estate sign.